Year after year, the world has seen its share of weather-related disasters wreak havoc on communities all over. So far, over 2 billion people have been impacted by some form of weather-related disasters. The common denominator among most of these disasters? Water. According to a U.S. News report highlighting 2018’s deadliest natural disasters, more than 50 percent of the listed disasters are water-related. Moreover, the World Economic Forum’s 2018 Global Risk Landscape notes that water crises are more likely to happen and will impact more than just local communities. These risks are more than societal and environmental. They are economic. A growing number of investors are beginning to recognise water’s true value and weighing its risks and exposures against business impacts, as well as return on investments. Accounting firms such as PWC’s sustainability unit classify water as a business risk that needs to be actively managed across the supply chain. More environmental, social, and governance (ESG) research providers are working to improve water data, scoring, and measurements. Investors are continuing to pressure companies to disclose more about their supply chain and governance practices. They are defining water not only as a valuable resource but one that demands fiduciary responsibility. Through shareholder engagements, investors are collectively asking companies and their boards how they are addressing water risks and exposure. In 2017, Ceres highlighted the top five drivers of water risk and several water impacted companies in the update of Feeding Ourselves Thirsty, which focused on agribusiness. Since agricultural production uses more than 70 percent of the world’s freshwater resources, the companies in this sector have a higher risk exposure to the approaching water crisis, leaving investors questioning the best way to position portfolios. A 2017 MSCI analysis of food companies in the All Country World index noted that USD459bn in revenue may be at risk from a lack of water available for irrigation or animal consumption. Population growth and deepening climate impacts – as evidenced by the recent U.S. Climate Change Assessment – further compound these water risks. By 2030, demand for water is expected to exceed supply by 40 percent. In some regions, like East Asia, the Middle East, and Central Africa, could see as much as a 6 percent contraction in GDP by 2050, due to water-related impacts on agriculture, health, and incomes. These water-related risks to business have multiple material impacts for investors, which could result in portfolio underperformance, increased volatility, and potentially non-diversifiable risks across asset classes. In an effort to address these water risks with investors, Ceres released the Investor Water Toolkit. Developed in collaboration with more than 40 institutional investors from Ceres’ Investor Water Hub, this “how-to” guide enables investors to evaluate water risks across all asset classes, design strategies for mitigating water risks in their investment portfolios and complements the ongoing work of CWR. It is the first such comprehensive resource created for all investors, from foundations, to pension funds, to asset managers, both large and small. Evolve and capture new ideas through time. 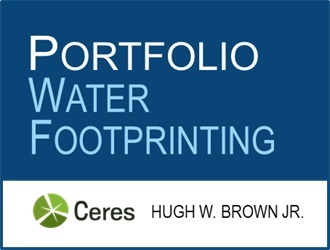 In the past year, Ceres continued to evolve research to address investor water risks in collaboration with Investor Water Hub members including in one key area — portfolio water footprinting. Water footprinting for investment analysis (or investment water footprinting) is an emerging method to determine where an investment portfolio has large portions of high-water risk industries or stocks. It can assess volumetric use of water by companies, or assess water risk by geography, types of water risk exposure or by water risk scores or other parameters. The approach is adaptable to the needs of the investor end-user. Overall, it allows portfolio managers to understand aggregate risk exposure and hone in on specific industries and companies for further water risk research. For asset owners, it also provides a useful starting point to engage portfolio managers on the topic of water risk awareness and integration. Figure 1 shows the market-cap-weighted water footprint of the four major indices by exposure to high water risk industries. 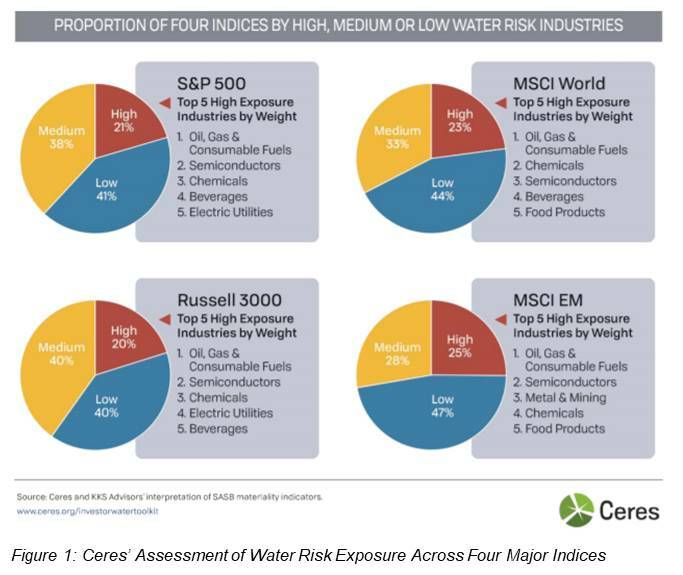 An important observation is that more than 50 percent of the components of the four indices are exposed to medium to high water risks, showing that water can be a very material issue for portfolio managers. Given that there is such a high exposure to water-related risks across indices, these results underline the importance of considering more detailed and sophisticated water footprinting to better understand potential risks. The future of water footprinting is evolving rapidly in exciting new directions with investors actively seeking ways to understand the materiality of water across industries as a first level indicator of water risk exposure. The added complexity with water footprinting is that unlike carbon footprinting, water is a local issue. Water risks are multifactorial issues based on water resource dependency (industry-specific) and water security (location-specific) and management’s response to mitigate these risks. Ceres is continuing to build water footprinting methods in 2019 building on efforts by investors such as those by the Florida state pension fund (SBA Florida) (see Figure 2). Assessing water risk in a visual way can stir critical conversations within portfolio teams. The water risk heat map in Figure 2 was designed to quickly provide a visual assessment of overall risks and where to perform a deep dive on any sector or specific company for further review driving both water risk and exposure, as well as engagement and buy/sell analysis. 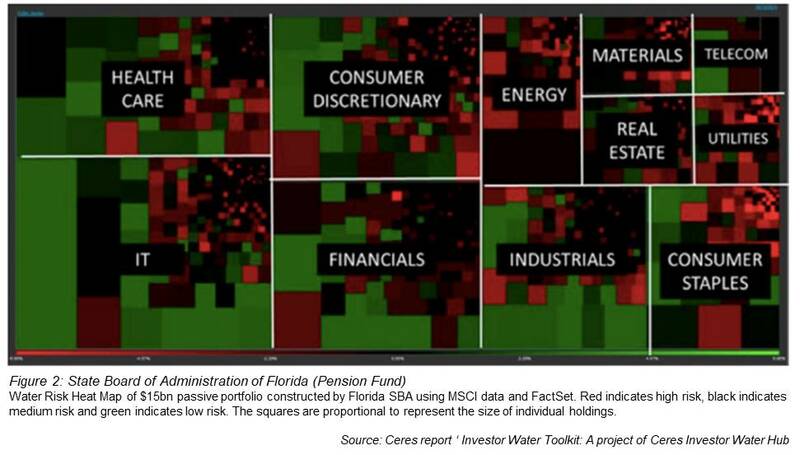 This heat map clearly illustrates where the portfolio has large sector holdings, and which holdings within a sector have the potential to be a significant water risk position (e.g. consumer staples, industrials). Figure 2 also displays smaller holdings in real estate, utilities, and energy – that, in aggregate, expose the portfolio to potential water risks. Overall, new horizons are ahead as investors, ESG research providers, and other stakeholders adapt their water footprinting methods even further. Water represents tremendous risks – and opportunities – for major companies and investors. Although investors are beginning to assess their exposure to water risks, there is much more work to be done on this increasingly material issue. It will take a large swath of global investors to revalue water analyses on Wall Street and visually interpret water risk and exposures in terms of economic impacts. Author: Hugh W. Brown Jr.
Hugh helps lead the Investor Water Hub, a working group of the Ceres Investor Network made up of more than 90 institutional investors with $19 trillion in assets under management. The Hub promotes peer-to-peer learning and has recently developed a how-to-guide on water integration called the Investor Water Toolkit. Hugh drives research that deepens investors' understanding of sustainability and water risks (and opportunities) in their portfolios and how to practically embed those considerations into daily investment decision making. Hugh previously worked at SBA Florida, the $150bn state pension fund, where he focused on ESG and water integration across asset class analysis and risk management research. Hugh has also worked for Morgan Stanley and Northwestern Mutual. In addition to his thought leadership in ESG integration, Hugh has served his country and others through service in the U.S. Air Force and by sitting on several non-profit boards.